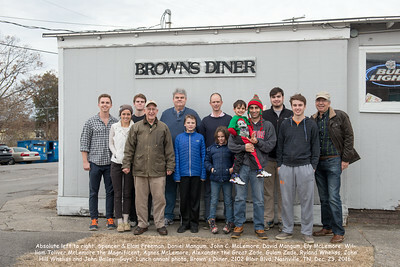 Absolute left to right: Spencer & Elam Freeman, Daniel Mangum, John C. McLemore, David Mangum, Ely McLemore, William Toliver McLemore the Magnificent, Agnes McLemore, Alexander the Great Zade, Gulam Zade, Ryland Wheliss, John Hill Wheliss and John Bailey--Guys' Lunch annual photo, Brown's Diner, 2102 Blair Blvd, Nashville, TN, Dec. 23, 2016. 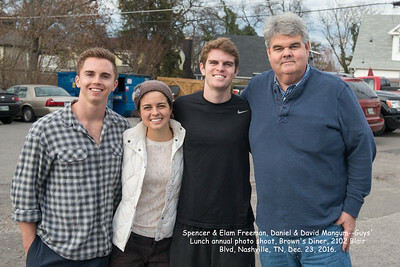 Spencer & Elam Freeman, Daniel & David Mangum--Guys' Lunch annual photo, Brown's Diner, 2102 Blair Blvd, Nashville, TN 37212, Dec. 23, 2016. 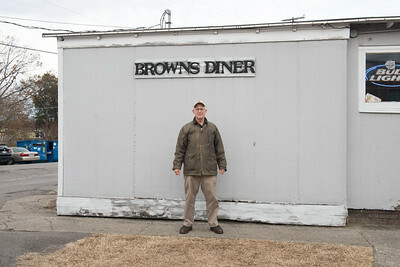 John C. McLemore--Guys' Lunch annual photo, Brown's Diner, 2102 Blair Blvd, Nashville, TN 37212, Dec. 23, 2016.